What better venue for a wedding than at your family’s own lakeside retreat! Tim and Michelle were married in Sister Lakes in Southwest Michigan, and had both their ceremony and reception at the groom’s family cabin, right on the shores of Round Lake. Following a guitarist who played and sang some classic rock songs, I played a wide variety of solo harp music. Tim put together one of the most eclectic request lists I’ve ever seen! Ranging from Renaissance dance tunes to classical harp recital pieces to Billy Joel, Van Morrison, and the Police, there was truly something for everyone in attendance to enjoy! As I played, guests enjoyed dinner and the sunset. The pontoon boat was ready to go! 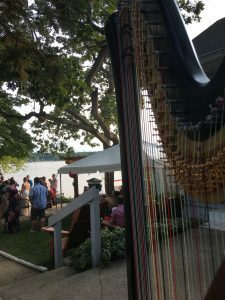 No matter what your musical taste, a skilled harpist can accommodate your requests. The genres I play cover classical music from the Renaissance to today, current Top 40, Bollywood hits, Celtic tunes, sacred music, Broadway songs, jazz standards, Jewish music, rock ballads, and more. 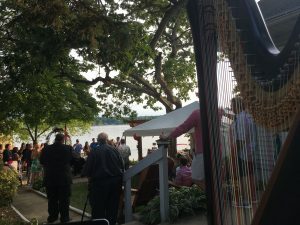 I play for weddings in Southwest Michigan and beyond. Please visit my website (Southwest Michigan Harpist) for details! This entry was posted in Wedding Receptions, Weddings and tagged at home, reception, sister lakes, southwest michigan, wedding. Bookmark the permalink.